We like to have fun here at bonksmullet.com, but sometimes we forget the real objective of this site - education. Take tonight's game against the Washington Capitals, for example - we could make "jokes", and try to be "funny", but would you end up learning any more about the Capitals that way? How much do you know about the Capitals, anyway? Can you name any of their players other than Ovechkin? Do you know which division they're playing in this year? Did you know they used to be called the Bullets? Didn't think so. We're going to use the rest of this recap to introduce you to a number of Washington Capitals players who figured into tonight's outcome against the Senators. Which ones, you ask? Let's find out! This is Eric Fehr. Eric has spent most of his career as a third-line winger with the Capitals, even topping 20 goals during the 2009-10 season. This year he's been in and out of the lineup after spending last year in Europe, so you know how he can demonstrate his value to coach Adam Oates? Perseverance. Although the Senators come out strong in the first and outshoot the Capitals early, it's Fehr that takes control mid-way through the first following a Chris Neil penalty, making it 1-0 Capitals after "capital-izing" on one of the Senators' patented defensive breakdowns. This is Troy Brouwer. 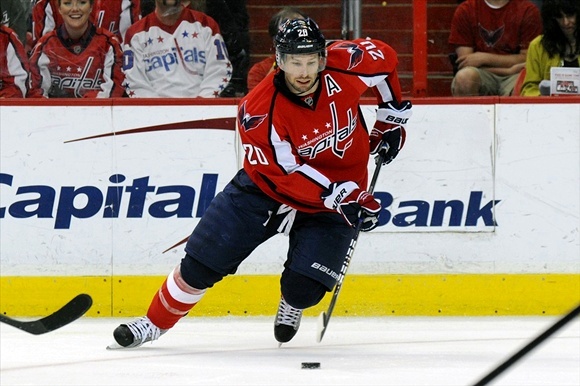 Brouwer is another grinding, secondary-scoring winger for the Capitals who has played with the Capitals for the last few years after coming up with the Blackhawks and winning a Stanley Cup in 2010. It's Brouwer who loses a faceoff to Kyle Turris shortly after the Fehr goal, which sets up a Patrick Wiercioch point shot that's redirected in front of the net by Bobby Ryan. 1-1. Better luck next time, Troy! This is Marcus Johansson. Marcus is an up-and-coming Swedish winger who was drafted by the Capitals a few years ago. As a Swede, he has great hair, flashy puck skills, and a love of pickled herring. He's also proactive enough to "capital-ize" (joke property of bonksmullet dot com) on a Zack Smith hooking penalty late in the third, as Capitals pressure forces Craig Anderson way out of position and leaves Johansson with an easy put-back on an open net. 2-1 Capitals. Uh oh. This is Brooks Laich. Brooks is actually a former Senator, having been drafted in 2001 and traded in 2003 for 23 middling, rented games of Peter Bondra (the scoring precursor to Erik Condra, himself the precursor to 2019 draft pick Carl Dondra). Laich has been a quality, role-player centre for the Capitals for several years, and, 47 seconds after Johansson's goal, is exactly the kind of veteran to identify and "capital-ize" (property of bonksmullet dot com) on another lazy turnover in front of the Senators' net, making it 3-1 Capitals. Yep, looks like this game is over. This is Braden Holtby. Braden is the young, future star goalie for the Capitals who may even feature as the third goalie on this year's Canadian Olympic team. After a strong first period, it's Holtby who gives up a blistering dot-shot from Chris Phillips during the Senators' second power play of the evening. While Holtby can be forgiven for being beat by Phillips' trademark laser beam, he can't be forgiven for not recognizing the statistical importance of a Chris Phillips goal from a win-probability standpoint. (FORESHADOWING!) 3-2 Capitals. This is Alex Ovechkin. You've heard of him, right? Well, Alex is a big star but his biggest contribution to the outcome of this game comes midway through the second when he loses a puck battle in his own zone to a reinvigorated Colin Greening, who skates all the way down the ice and fires a screened wrist shot past Holtby to make it 3-3. It's Greening's first goal of the year, and the capper on a second period in which the Senators outshoot the Capitals 19-3. Looks like you're old and busted, Alex - it's Greening who's the new hotness! Right? This is Karl Alzner. Karl is a promising young defenseman for the Capitals who's victimized by a Mika Zibanejad redirect in front of the net off a Jason Spezza point shot during a Senators power play early in the third period. 4-3 Senators. Wait, what? Are the Senators going to actually pull this one out? This is a road game, right? On a day that ends with a ”y”? This is John Carlson. Although John is the less-famous defenseman named C/Karls(s)on in this game, he's the first to score a goal with three minutes to go in the third, after Zack Smith goes to the box and Carlson's point shot off a won faceoff beats Craig Anderson to tie the game at 4-4. It's not over yet - will Washington's Carlson reign supreme, or can Ottawa muster one last rally? This is Nate Schmidt, rookie defenseman for the Capitals, who's beat by a redemption-seeking Zack Smith on a rush with Chris Neil a minute after getting out of the box. 5-4 Senators. When you're #15, and somebody tells you they love you, you just scored the game-winner. Thumbs up, Zack! This is an empty net. This net gives up Bobby Ryan's second goal of the night in the last minute of play, after the Capitals pull Holtby. Get it together, net! 6-4 Senators is your final. Although the Capitals put the Senators on the ropes in the first period, Ottawa played one of its best full games of hockey this season, winning faceoffs and outshooting and outchancing the Capitals through most of the game. More importantly, you learned the names and basic, Wikipedia-level facts about several Washington Capitals players tonight, and long after the glow of tonight's win has faded, that's what will stick with you. You're welcome, and we'll see you tomorrow night for a home game against the Canucks!